Leo Joseph Kushi, Jr. 41 of North Creek and Newcomb passed away peacefully of natural causes on March 9, 2016. He was born November 3, 1974. Leo was the son of Audrey and the late Leo Kushi, Sr.
Leo dedicated over 15 years to the North Creek Volunteer Fire Department. 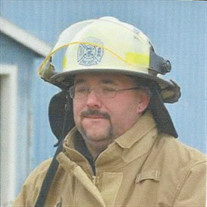 Most recently serving as Assistant Chief. Leo also served as safety officer and truck captain throughout his years. Leo's passion for fire service was clearly seen in his ability and desire to teach and guide his fellow firefighters, junior firefighters and explorers. Leo embodied the fireman spirit with honor and dignity. Leo was also a past member of Johnsburg EMS. Leo leaves behind two beautiful teenage sons, Michael and Patrick. Leo's love for his sons was tireless, patient and kind. He raised his sons to be gentle, respectful men. Leo passed his love for fishing onto his boys, often times sneaking them out of school to cast a line at Lake Henderson or the Hudson. Besides his Mother and his two sons Leo also leaves behind his loving sister Brenda McMahon, her husband Christopher, his nephew Brandon Collard, many cousins, friends and firehouse brothers and sisters. Leo shared his commitment, love and life with his longtime girlfriend Rachael DuRose and her son Lucas Dunkley whom Leo loved as his own and taught many life lessons. Leo was a dedicated employee at The Alpine Lodge in North Creek. Services will be held in Leo's honor on Tuesday, March 15, 2016 at St. Therese Catholic Church, Newcomb with calling hours beginning at 10:00, funeral services to follow and a celebration of life at the North Creek firehouse. In lieu of flowers the family requests donations be sent to Community Bank of North Creek to assist Leo's sons Patrick and Michael.